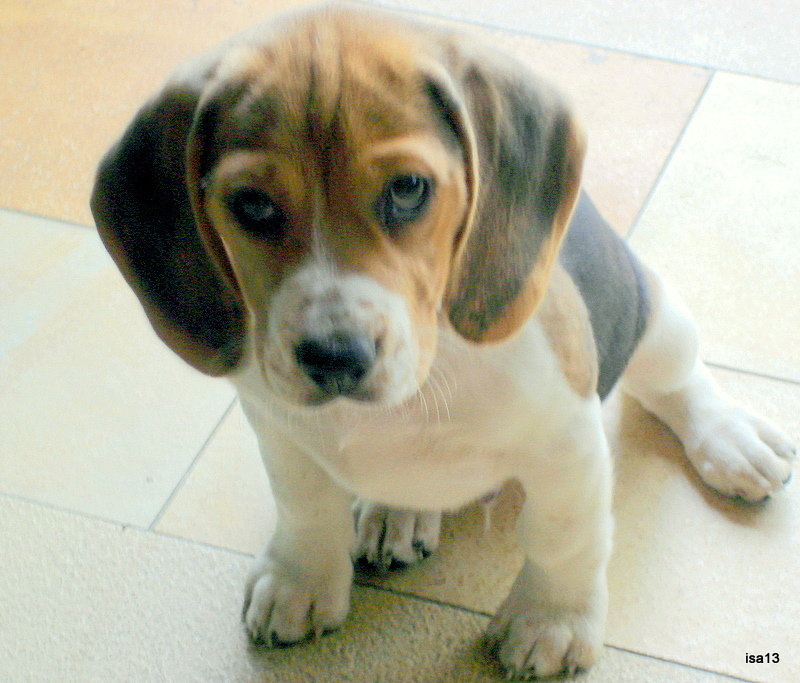 About three years ago, this shy and unsure little guy arrived in our home from the South of France (Provence), just in time for my birthday 😉 A ten weeks’ old Beagle looking up at me with eyes that seemed to say: “Here I am, tired from the long drive, my heart and stomach feeling strange, away from my mom and pack of brothers and sisters… Will you love me ?” If the picture is a bit blurred, it is because my eyes were a bit misty too. 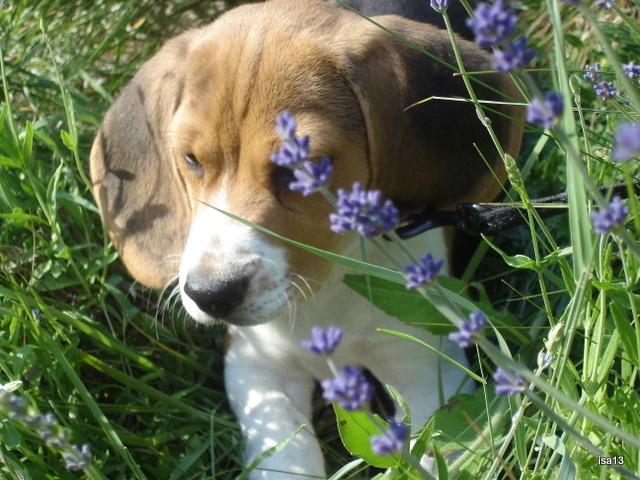 A few weeks later, Nino was already exploring the jungle of lavender flowers whose scent may have reminded him of those vast blue fields that spread over plains and hills in the Provence. Something familiar for him. Life is not always a tranquil river… (Title of a French movie). 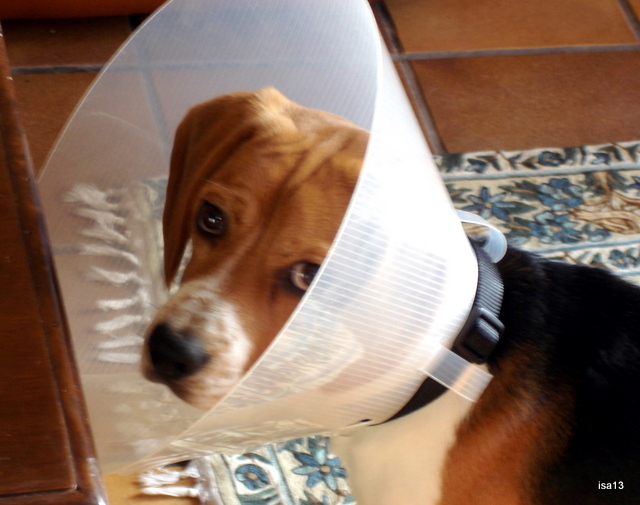 At 8 months, Nino had a surgery and came out of the vet’s with this strange and cumbersome kind of hat. It did not prevent him to walk and run head down though, scraping against any stone or branch that was on his way to some interesting scent. 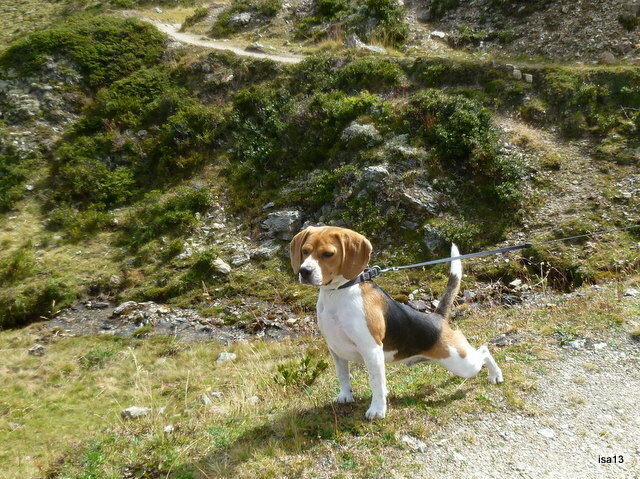 Month after month he grew up into a strong, energetic and alert Beagle, always so happy to walk or run along mountain tracks. Sometimes on the leash when cows were pasturing nearby, sometimes as free as the air and totally oblivious of my “retour/return !” command. My second son, a soccer player, gave me a referee whistle. Its shrill sounds seems to bring him back to me. Sometimes. Although a Southerner, Nino really adapted very well to our long winters. 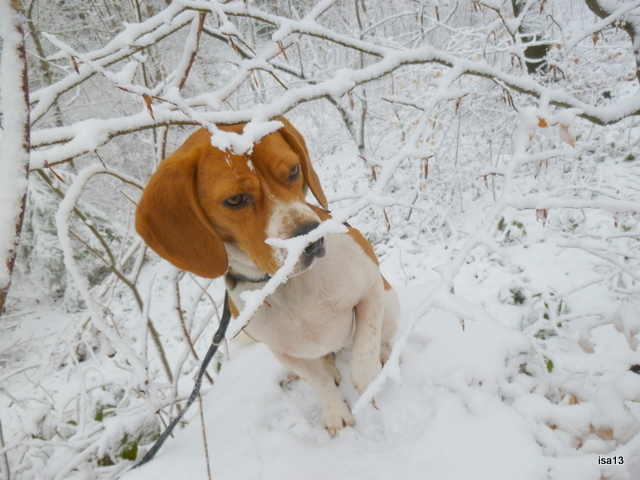 He is never cold nor tired to walk in the snowy forests. His short but thick fur keeps him warmer than any coat I could wear. 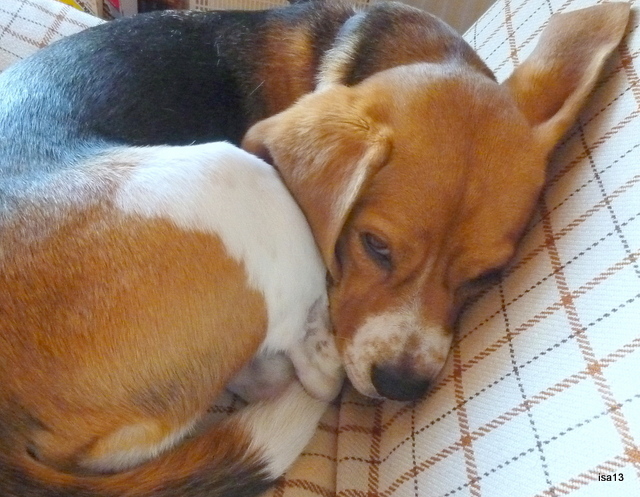 No cold feet nor frozen fingers for my Beagle. On and on he keeps exploring and digging under the snow. At the end of March though, I almost lost my Nino. During a walk across a field, he ate something poisonous, real bad. I never saw what it was and the vets who took care of him for three days could not find out either. He had a terrible fit, uncontrollable convulsions. It took him a few weeks and more medicines to recover. Calm, sleepy, recovering slowly but surely. I will never forget this moment of panic, Nino trembling violently, his four legs all stiff, his imploring eyes saying “help me !” and am so grateful to the vets who cured him so well. 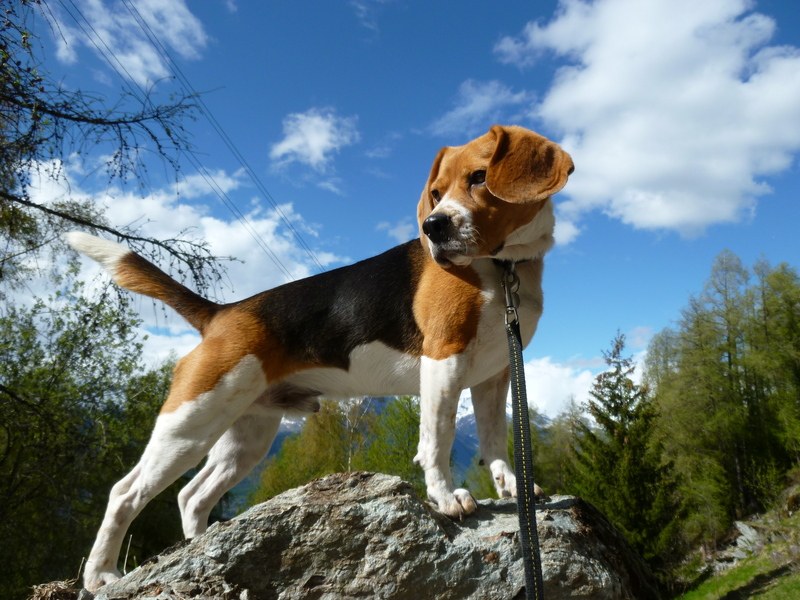 A strong little Beagle. Nino has now fully recovered, as you see from this picture taken yesterday during a walk. He is again the determined and tireless dog that he was before he got ill. Strong and alert in his element, Nature. This conqueror’s attitude… has he been inspired by Napoléon crossing the Alps ? ;) I think Nino still has a lot more to enjoy and explore. Happy Birthday, little buddy !